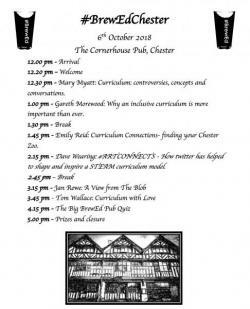 When pints met pedagogy: Gareth D Morewood summarises his experience of speaking at a new breed of event. 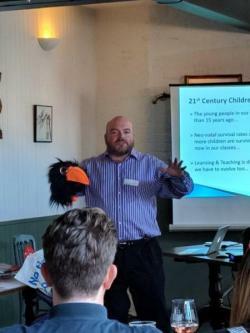 Quite a long time has passed since I became a newly qualified teacher in the 1990s, and during those years I’ve attended a countless number of Inset days and CPD events – many of a variable quality. So last weekend I was pretty excited to attend a brand new event, #BrewEd, in Chester, which had the added bonus of being not far from my own home in North Wales. Whenever I’m invited to speak at an event, I like to know all the minute details and specific arrangements in advance. This isn’t ‘control freakery’, but rather a desire to minimise the risk of logistical nightmares, and get a sense of how different events are managed. For what would be a completely new experience, I felt it was important to establish whether presenters needed a presentation or could go ‘freestyle’, how the venue would be laid out, what sort of primary-secondary balance I could expect and so on. I was sent a schedule for the day, along with details of the technical arrangements. One unexpected detail was that each presenter would have their own ‘walk-on music’. Although I didn’t know about this beforehand, maybe it’s something I should consider for future events. I wonder what readers feel would be a suitable theme. Having been brought up on the ‘traditional’ five Inset days, with the occasional full-day course, it is really refreshing to see professional development ‘reclaimed’ by the profession. On the strength of last week’s experience I would certainly put #BrewEd (along with a number of other initiatives) in that category: an event that, while quite different to traditional courses or conferences, really drills down to the practical discussion, and provides a positive discourse for teachers and other professionals alike. One thing that struck me about this event was its pace. The shortness of each presentation allowed us to cover a real breadth of topics, which, along with the quality of the content, generated some pretty deep thinking and discussion on the theme of the day: the curriculum. As well as the questions asked during and after each session, there was a lot of conversation over the breaks too. The day’s professional discourse was a testament to how intelligent the education debate has become, especially when I compare it to what I remember from my experiences as a 21-year-old NQT. The main focus of the afternoon, of course, was the content and debate, for which there was no better starting point than Mary Myatt’s (@MaryMyatt) session on the current controversies, concepts and conversations surrounding the curriculum. Drawing on her considerable experience, Mary explained why it’s ‘better to do a few things in greater depth’ than try to cover too much superficially, and why the curriculum should be ‘high challenge and low threat’. Mary continued with several well-reasoned concepts. One that stood out for me was her view about being ‘better to do a few things in greater depth’ than try to cover too much superficially. For me this is an important element of good curriculum design. Learning topics simply to pass a test or assessment doesn’t allow for a depth of understanding. How learning is sequenced especially important for SEND pupils: building knowledge needs to be carefully structured. It should come as no surprise that Mary’s insights are pertinent to the creation of a truly inclusive curriculum. In fact, the points she raised chimed so well with the subject of my own presentation – why it is so important that schools offer an inclusive curriculum - that the afternoon became even more powerful for me. Rarely had I given so much thought as to why the design and delivery of the curriculum is so essential to securing positive outcomes. Mary also raised an important point about revising the curriculum. She argued that change should come incrementally: do things well, make sure there’s enough depth. Again I would draw a parallel with how schools develop an inclusive approach. Too often I’ve seen the desire for short-term gain result in ‘wholesale’ changes that compromise the depth of learning. Taking time to consider proposed changes carefully, always with a view to how pupils will benefit, is the hallmark of good practice. No amount of intervention can compensate for poor teaching. Providing appropriate opportunities for teachers to develop will compliment a school’s carefully designed curriculum. There’s no point having a fantastic curriculum if it is taught poorly. And conversely, high quality teaching cannot compensate for a poor curriculum offer. These complimentary factors again provided some new clarity directly as a result of the #BrewEd event. I will no doubt have more to say on this in a future post. One idea that I sought to put across in my session is that, in addition to having a robust understanding of the curriculum we teach, and how it benefits all learners, we should also make sure that parents and carers understand it too. The importance of these partnerships for learning cannot be overstated, and they continue to be the bedrock for my work with young people and their families. Too often a school’s curriculum can create barriers, but with sensible design and effective communication this needn’t be the case. My greatest praise for #BrewED is that it stimulated thinking in areas that I had previously overlooked, and will be a thread in many blog posts and other work to come. What I first presumed would be just a great afternoon with a few pints turned out to be one of the most significant events of my career. If you get the chance to attend a future #BrewEd event, or at the very least something that shares the same commitment to grassroots professional development, I strongly recommend that you do. The opportunities we all have, as teachers, support staff, anyone involved in education, to develop our practice are greater in number and quality than when I started my career, and #BrewEd may be the sign of even better things to come: I’ll drink to that! 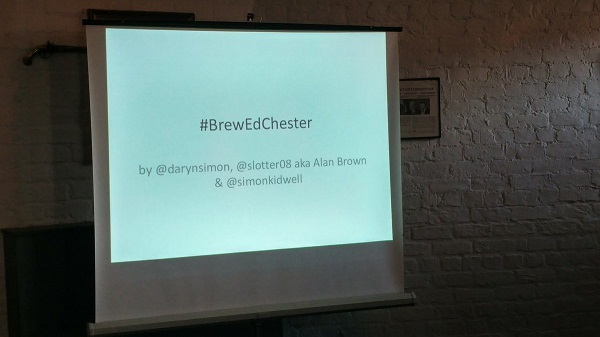 For more information on upcoming #BrewEd events, search for the hashtag on Twitter.